It’s time to look at a very classic mix of live action and cartoons. This is one of those films that I have certainly known about for a very long time, but never actually got to watch until now. It’s certainly a lot of fun and I can see why it became such a hit. Despite that, it does have its share of issues in regards to the pacing, Jessica Rabbit, and the main character. Well, lets dive into this! The film follows a private eye known as Eddie. He doesn’t like the Toons that are always running around because they murdered his brother. Still, he can’t quite escape them since he lives in a world where they have found out how to make all of the classic Disney and Warner Bros characters real. These characters are also completely immortal except when it comes to a specific kind of acid which inflicts permadeath on them. Well, Eddie has been hired to find some blackmail that they can use to get Roger to work a little more seriously. The plan is actually rather suspect from the start since making him depressed could make his work get worse. Unfortunately, instead the blackmail of his wife Jessica cheating on him by playing patticake with some guy ends up making Roger crazier than expected. He seemingly murders the guy and then runs off. Eddie doesn’t care what happens to Roger, but unfortunately Roger lets everyone know that he and Eddie are a team by going to his apartment and now Eddie will have to solve the case to save his own skin. It’s definitely pretty surreal to see characters like Mickey Mouse and Bugs Bunny running around during the film. I like the concept of having a whole town of cartoons just causing mayhem and that the ones on TV are actually real. Of course, it does make you wonder why the Toons don’t do anything to stop their oppressors. If we buy Roger’s reasoning then they just want to make people smile so getting violent is out of the question. Still, that just doesn’t work since we know that some work as bouncers and others do actually get aggressive. It would have been awesome if at the end the Looney Tunes had banded together for a big fight. This isn’t that kind of movie so I wasn’t expecting that, but you just have to wonder why they just sit there and take it. Who knows how many Toons had already been murdered by this point. The story is actually dark when you think about it. The scene of the toon getting murdered on screen was particularly vicious and definitely showed that Doom has no mercy. Quickly lets talk about the main character. I’m afraid that I don’t like Eddie. He’s fun for the first bit of the film as he talks tough to all of the characters and doesn’t like the Toons. However, he loses any sense of toughness when Jessica shows up and humiliates him in front of everyone. He has no real will power and just can’t seem to stand up to her. It’s pretty disgraceful if you ask me and especially since the whole scene was part of the villain’s plot. He basically stepped right into their hands. From that point on it was over for him. his dance at the end wasn’t particularly impressive either. Then we have Dolores. This was not a well developed romance between her and Eddie. The whole time you are just wondering why this had to happen. They seemed rather antagonistic at the beginning of the film so I don’t know what pushed them together so well by the end. I guess the tense situation just got them to realize the important things in life. She isn’t a bad character, but doesn’t really contribute anything to the story either. Next up is Doom, the main villain of the film. He’s definitely an intense character and a very smart one as well since he came up with the super powerful goop. The guy really does a good job of bringing in the fear whenever he shows up. He even knows a lot about the Toons which makes it easy for him to hunt them effectively. We get a twist about the characters which is handled really well and he can fight with great proficiency too. Doom is really the complete package as far as villains go. Then we’ve got Roger, basically the main Toon of the film. Unfortunately his whole gimmick is that he isn’t smart at all and just gets the heroes in trouble all the time. His only goal in life is to make people laugh and that purpose overrides everything else including his self preservation instinct. If there is a laugh to be had you will certainly find Roger Rabbit. As a result, it’s definitely hard to root for this guy or even to sympathize with him. If he is always sabotaging everyone’s attempts to help him, then maybe it’s for the best that Doom nabs him. With someone as impulsive and unreliable as Roger, perhaps it wouldn’t be too much to assume that he did commit the murder. Anything is possible with this guy. In the 1-2 scenes that Bugs Bunny appears, he has a much better character and personality than Roger. He’s still rather mean and Mickey calls him out on it, but at least Bugs is smart and will always manage to survive. In comparison, Daffy seems to lose out again as his only real scene is a big fight between him and Donald where Donald has the upper hand the whole time. I guess we finally know which duck would win in a fight. Jessica is certainly an interesting case as the whole point of her character is to be used for fanservice. Does this mean I shouldn’t really count it as fanservice?…Nah. It’s still fanservice for sure and her opening scene is quite brutal. Her character design is purposefully parodyish so you’re supposed to wonder why every character is so impressed as she isn’t all that impressive, but the bouncing effects of her character reach Dead or Alive levels. She gets a lot of red herring moments and does seem to be legitimately tough at times, but it’s certainly hard to root for her as well. The film could have definitely toned her down a bit as well to make her character be taken a little more seriously. We should have just had the rabbit from Space Jam, now there was a quality character. So, the pacing does slow down somewhat for the second half. The first half of the film where Eddie doesn’t get along with the Tunes is certainly the best part. That’s usually the case for mean main characters like this who get nice by the end. They just aren’t as interesting as when they started out. The end gave us some nice action scenes though and the car chases were pretty fun. The movie surprisingly had a lot of restraint for not relying on the guest stars too much. It would have been really cool if they could have showed up more, but they probably would have ended up stealing the whole movie so it may have been a good idea to keep them out. The writing is pretty solid I’d say. We get some nice burns from most of the characters and nice references as well. As far as the animation goes, I’d say that it looks good as well. It’s certainly interesting to see how they draw some of the characters as Daffy looks way different than he does in the classic shorts. The animation blends together rather well and the only time it looks even mildly choppy was when Eddie was thrown by one of the bigger toons during the movie. It must have been a lot of work so they definitely put in the effort. I’d definitely like another take on this concept since there’s so much that can be done with it. We could easily get some kind of sequel or spinoff that could continue things. I want to see a full scale revolution from the Toons. They are clearly still underpaid and used by the humans so they need to demand justice. As the film shows that they are quite powerful, it would be difficult to stop them. We need a cool sequiel like that and of course there is a wider range of characters that could be thrown in now. The sky’s the limit. Overall, Who Framed Roger Rabbit is a solid film. It’s definitely fun and shows other films how to mix animated and live action styles the right way. The fanservice in the film is probably about as lenient as it gets thanks to the animation and while the pacing does get slow at times, it doesn’t last for too long. The positives of the film do end up outweighing the negatives. That being said, this film certainly isn’t in the same league as Space Jam so lets not forget the true legend of this genre. I doubt that film will ever be surpassed by another Looney Tunes/animation blend sort of film. It was just perfect and I wouldn’t have minded if Doom had challenged them to a quick game at the end. I would have been up for that is all I’m saying. 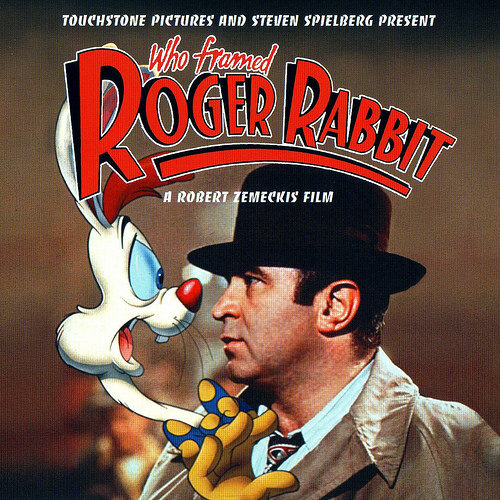 This entry was posted in Live Action Movie Reviews, Live Action Movies, Reviews and tagged Animated, Bugs Bunny, Cartoon, Comedy, Disney, Film Review, Mickey Mouse, Movie Review, Review, Warner Bros, Who Framed Roger Rabbit by dreager1. Bookmark the permalink. It’d definitely be cool to be walking down the block and suddenly be face to face with someone like Bugs. I’d certainly be hyped for Toons to be real!